Positives: Pierce is looking more as a creator this year averaging a career high in assists per game. 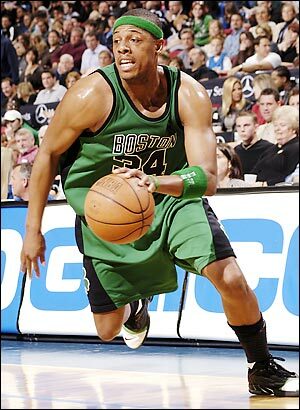 Especially in games where Rondo is out, Pierce takes over ball handling duties and creates for other players. He has been looking more of the Pierce of old as of late as he is attacking the rim and getting much more in game shape. Is still the Celtics best scorer and has the ability to go off in a quarter. Above average defensive player who uses his strength on defense. Negatives: Pierce is averaging his lowest points per game since his rookie season in 98-99. Came into the season out of shape and used at least the first fifteen games to get acclimated to playing again. Lost a lot of athleticism and age is becoming a factor. Positives: Expectations were low for Pietrus as he was a late signing and coming off of a knee surgery. He has been a major surprise to the Celtics, providing key 3 point shooting and great defense. He has lit a fire into the second unit and allowed Doc not to have to play Sasha Pavlovic or Marquis Daniels extended time. Doc has helped him out a lot this season, he has progressed from a player who has great defensive talents, to being a great defensive players. Negatives: Has been relatively cold lately from beyond the arc. Cannot really create his own shot, is more of a spot up shooter. May be due to his poor ball handling ability, has only become a 3-point threat offensively. Positives: Not too much to be positive of here. Pavlovic has shown in the past that he can be a 3 point shooter. Every once in a while he comes up with a steal or two as he did against Orlando this year. Negatives: Where should I start? Sasha does not get to the line, has trouble driving the ball to the basket, and has a non-existent post game. He does not have a handle to run the point guard position or gets rebounds on the offensive or defensive glass unless they fall to him. He is more or less Scal without bringing anything else to the table. I wish the Celtics would have used his money to sign Gerald Green back to the team (as the Nets just did). This entry was posted in Celtics and tagged All Star Break, boston celtics, Grades, Mickael Pietrus, paul pierce, Sasha Pavlovic, Small Forwards by leibo4. Bookmark the permalink.